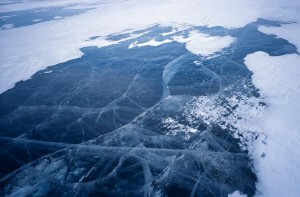 We are expecting to take 43 days to cover the 2300 kilometers of Lake Baikal’s shoreline, averaging 55 kilometers per day. Although there are certain to be days where we will ride more than 55 kilometers, we also expect to encounter significant disruptions in the ice, which will impede our progress, as well as inclement weather such as high winds and snow storms which could confine us to our tents for days. Our primary challenges will be dealing with bone chilling temperatures, dropping to as low as -40 degrees Celsius, on a daily basis and contending with variable ice and snow conditions. In the event of significant snow accumulation we may have a hard time making distance. It is not uncommon for large areas of ice to become fragmented, forming trenches and walls of fractured ice that require considerable detours. Provisions, we are hoping will not be too hard to come by, as there are many small settlements around the lake. We expect the maximum number of days that we will travel between settlements with no opportunity to buy food or unleaded fuel for our stoves to be 14 days. Both the northeastern and northwestern sections of Baikal’s shoreline are remote, with no road access and very few areas of human settlement.